The Zpacks Cuben Fiber Roll Top Dry Bags are stuff sacks with the body of the sack being sewn from 1.0 oz/sq yd Cuben Fiber. They are tape sealed with seam tape down each side and across the bottom of the bag. 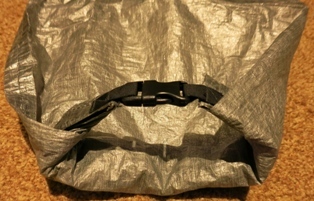 The top has a roll-top design with a full strip of hook-and-loop that holds the top closed. It can then be rolled as tightly as I prefer and clipped together to keep it from unrolling. I'd call it a typical dry bag closure. Since the fabric is water and airtight, I can also compress my contents by forcing the air out as I close the top. To open the sack I just unclip the roll-top and pull on the tabs on either side of the hook-and-loop closure top. Zpacks offers a one-year warranty against defects in materials or workmanship. I bought two Zpacks medium dry bags after a rainy backpacking trip just over a year ago when our old dry sack seams failed and our quilt got a little wet. I looked around for the lightest, most waterproof sack and decided upon the Zpacks due to their use of Cuben Fiber. I have since used the stuff sacks on every backpacking trip for a total of eleven trips and 38 days of use. 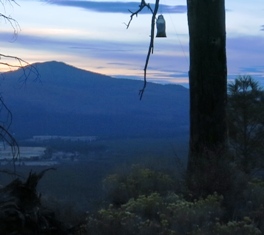 Conditions ranged from summer clear days to thunderstorms to winter snowshoe backpacking trips. Pacific Crest Trail, Southern Sierra Nevada, California: 4 days, 53 mi (85 km); 5,264 to 8,009 ft (1,600 to 2,441 m) elevation; 41 to 85 F (5 to 29 C). Mostly clear with some breezes and some afternoon clouds. I use these sacks on every backpacking trip to hold our clothing and quilt. My husband and I prefer to store our gear that needs to be kept dry in waterproof stuff sacks rather than trying to protect our entire pack contents. So, this stuff sack is the only barrier since we don't use pack covers or pack liners. We use one of the medium-sized stuff sacks for our double-wide quilt and one for our clothing. We are able to fit all of our clothing in one sack including down jackets, spare socks, spare shirts, base layers, hats, etc. We store our rain gear outside of this sack. In the other stuff sack goes our quilt and two pillows. While the clothing bag gets pretty full on longer or colder trips, everything still fits with room to roll the top for a dry bag protection. Once in camp we have used the stuff sacks for hanging our food out of bears' reach. This has at times meant a jammed full and heavy sack of food that certainly put some stress on the seams. When filled the dry sacks provide a nice solid base for packing into the bottom of our packs with each of us packing one into our backpacks. Once in camp they both come out for fluffing up our quilt prior to bed and for dividing up our clothing for changing into clean overnight clothes. Although we never had intense storms while hiking that soaked our packs, the sacks have been completely waterproof even when using them to hang food in the rain. I recently tested them by filling them with water and they held tight except for a very slow drip from one sewn corner. 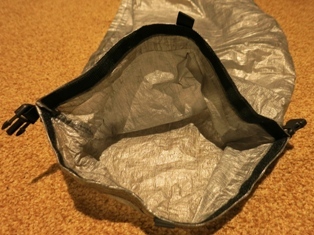 The Cuben Fiber itself is perfectly waterproof. This is plenty waterproof for keeping my down dry and I'll hit that seam with sealer this winter when re-proofing all of my gear. The durability has been very good especially considering using them for hanging food. There are no problems at all with the sacks and the only signs of wear may be a few loose threads and some wearing of the loop side of the hook-and-loop closure. 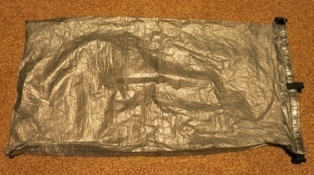 The Cuben Fiber itself has a lot of wrinkles where it was folded or rolled but it doesn't seem to affect the function of the sack at all. I love using these sacks and only have one minor issue with them. The hook side of the top closure tends to attach to certain clothing and fabrics when I'm stuffing the sacks. It can attach so well in fact that I slightly damage the fabric of my clothing when tearing it off since I don't do it very carefully or slowly. The Zpacks Cuben Fiber Roll Top Dry Bags are a nice addition to my pack providing a lightweight solution to keeping critical items dry on the trail.